On 22nd August the Bhet Gat Gurkha Nepalese Restaurant, Aldershot was the location that will subsequently seen as of historic importance. As a result of the UKNFS enabled UK Nepali Community advice access project, NRNA – UK Chief Patron Major Damar Ghale facilitated a meeting of the UK Census / Office of National Statistics [ONS] Head of Stakeholder Engagement, Mr Neil Townsend and two colleagues that had been enabled through the UKNFS enabled advice project. 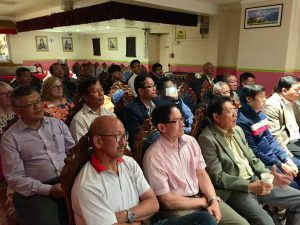 More than 35 UK Nepali community organisations leads, including amongst many illustrious others two Vice Presidents of the NRNA, and presidents of Tamu Dhee Association UK and Sahara UK, attended the meeting. Mr Townsend provided a valuable presentation that led to detailing many important details and inviutatons on how the UK Nepali community could gain a much stronger voice in the 2021 Census, and about how the Census / ONS worked and why it is important to participate in the Census. For 10 – 15 years the British Nepali community have rightly been focused on seeing a Nepali entry on this, the next, 2021 Census. On this many questions were raised, and much valuable information provided by Mr Townsend. 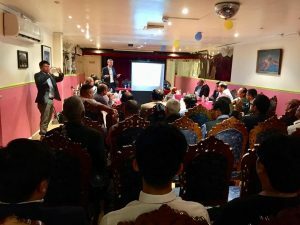 The UK Nepali community through its community leads and umbrella organisation the NRNA – UK, with UKNFS technical support is looking forward to making a strong representation for distinct Nepali voice in the 2021 Census. It was learned four other communities had been accepted to potentially have distinct entries on the 2021 Census, and that there was NOT a numerical threshold (nor lobbying / campaigning based) to be passed (this misconception until the evening of the 22nd August 2018 had always held back a concerted initiative to request the British State & Census include in the next Census a distinct Nepali tick box on its form). Research activity is currently going forward to consider options that until the information provided by the Census at the meeting, had not been thought possible, Major Ghale is making widespread liaison on community feeling and options on this important matter of UK Nepali voice in the Census, and the UKNFS is strongly supporting on research and technical support fronts. Major Ghale and UKNFS CEO Mr Alan Mercel-Sanca have received very enthusiastic & extensive thanks for their combined work in initiating and facilitating the meeting of 22nd August from our UK community and UK community organisation leads sides – who are mobilised by what they learned. Both Major Ghale and Mr Alan Mercel-Sanca also wish to record their great appreciation to Mr Neil Townsend and his team for their presentation and fielding all questions. Multiple requests for similar Census presentation meetings have resulted from community leads attending that evening – the next is likely to be in Basingstoke.